When John Allen first began working in the Spokane wine industry in the mid-1980s, things were different. At the grocery store, there might be about a quarter of an aisle of wine choices. At a restaurant, you'd be offered a white wine listed incorrectly as a "Chamblis," or maybe a red called a Burgundy. You might even find a third option on the menu — something pink labeled "blush." There were about 30 or 40 wineries in Washington at the time, but you'd have to be in the know to be aware that most of them existed, says Allen. He's recounting all of this outside the Washington Cracker Co. Building on a recent Sunday afternoon. Inside, you'll find most of the evidence you'd need to realize how much wine culture has changed in our region in the past three-plus decades, as a couple of hundred wine lovers taste their way through nearly 100 different wines at the Walla Walla Wine Invitational. Members of the discerning and educated crowd at the event — a benefit for the Inland Northwest Land Conservancy — ask nuanced questions of the winemakers on hand and make notes on the cards they received upon entering. By the end of the night, cases upon cases of wine will have been ordered for sale. "Wine has become a far more common part of people's life in Washington. It's part of our agriculture and our economy, and our social life," says Allen, who now co-owns Vino! A Wine Shop, the Washington Street store he founded with Nancy Sazama and Jennifer Haglund in 1995. Before that, Allen had poured wine at a number of places around Spokane, including Lindaman's, the now-defunct Crescent department store and a short-lived wine shop he started with his brother in the space now occupied by Mizuna restaurant. In addition to Vino!, Allen also works to produce wine events, like the Walla Walla Invitational. Today, Washington wine has become a culture unto itself, especially in Spokane, despite the city being more than 100 miles from the nearest prominent grape-growing area. The 2016 growing season saw the state's vineyards yield some 270,000 tons of grapes for Washington's more than 900 wineries, according to Washington State Wine, the industry group that represents all licensed wineries in the state. State schools, including Washington State University, provide for the study and research of wine even at the undergraduate level, while wine tourism has given a boost to places like Walla Walla and the Tri-Cities — places that weren't previously thought of as tourist hot spots. In turn, the rest of the wine world has come to take Washington wines seriously, with the state boasting 14 distinct American Viticultural Areas (AVAs) producing different ranges of grape varietals. As Allen swirls a bit of Walla Walla wine, he says that it's hard at this point to dispute the fact that our state is a special place to make wine. Again, Spokane is not a wine destination in the traditional sense. There are a few wineries growing grapes around here, but the climate isn't necessarily conducive to supporting a robust grape crop. That hasn't stopped wineries from finding success in Spokane, including stalwarts like Arbor Crest, which has been making wine at their scenic facility since 1984, as well as Latah Creek Wine Cellars, which dates back to 1982 and was a trailblazer in the Washington wine industry. For a less established winemaker like Darby McKee, who co-owns Overbluff Cellars, located within the Washington Cracker Co. Building, Spokane is a perfectly suitable place to make wine. "It's actually a little bit of an advantage being here, because we can go where the best grapes are," says McKee, who bought Overbluff from its previous owners four years ago with his wife Jovanka and business partner Mark Camp. Overbluff has worked with a number of different vineyard owners in recent years, sourcing grapes from the Rattlesnake Hills outside of Yakima and in the Walla Walla Valley. Rather than being tied down to a specific plot of their own land, Overbluff can, for example, get grapes for its Malbec from the cooler climates of southeastern Washington's Blue Mountains. At Barrister Winery, which has operated in Spokane since 2001, not having a vineyard of its own may be precisely what has brought the winery — which opened a new tasting room in downtown Spokane in 2015 — its bevy of awards and sizable wine club. "It is the diversity in the vineyards that helps contribute to the complexity in our wines. To have our own vineyard, we would have had to locate an established vineyard to purchase," says Greg Lipsker, who founded the winery with fellow lawyer Michael White. The two were later joined by a third partner, longtime Barrister employee Tyler Walters. "A new vineyard takes three years from planting to have a commercial production. As a vineyard ages, the wine produced from those vines develops more complexity," Lipsker says. The Lilac City has also proved attractive to wineries that actually do operate their own vineyards in one of the state's prosperous growing regions. Spokane will also see one of the state's bigger and more popular wineries come to town before the year is over when Maryhill Winery opens a tasting room in Kendall Yards, overlooking the Spokane River. 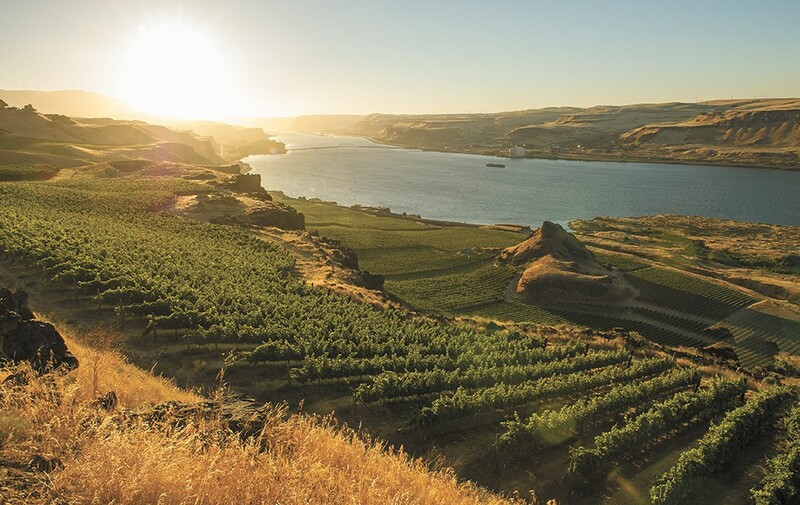 Maryhill's vineyards and current tasting room are located south of Goldendale on the banks of the Columbia River and host a popular concert series. But the semi-remote location isn't necessarily ideal, says Craig Leuthold, who founded Maryhill with his wife, Vicki, in 1999. "Not a lot of people make it down to our tasting room in the lower Columbia River Gorge, and we want to introduce people to the more than 50 wines that we bottle, of which only a handful are sold in this market," says Leuthold, adding that he and his wife own a house in Spokane and have always considered it home. When Joe Forest decided to expand his family's Tempus Winery beyond its current Walla Walla location, he didn't head back to his native Seattle, opting rather to open a tasting room in Spokane last month, on Post Street in the heart of downtown. Opening in a westside wine hotbed like Woodinville (home to more than 70 wineries and tasting rooms) didn't fit with his brand, says Forest. "I really like our niche in Spokane. We make a very restrained, Old World, food-friendly, classic-styled wine that's not screaming for attention," says Forest. "Spokane offers a great network of winery tasting rooms organized by the Cork District, and has yet to find a saturation point." Tempus wasn't the only Walla Walla winery to bring a presence to Spokane. Last fall, Va Piano opened a cozy tasting room on the bottom floor of the Historic Davenport Hotel. At least some of Spokane's attraction for wineries lately has to do with the Cork District, the collaborative marketing and promotional effort that's headed up by former Spokane City Council member Mike Allen, who teaches entrepreneurship at the Community Colleges of Spokane. In 2009, when Allen was still on the city council, he was looking at ways to improve tourism in Spokane and realized the sudden enormity of the Washington wine tourism industry. Spokane only had six tasting rooms in the city core at the time, but he saw an opportunity there. Now, there are 16 wineries with a presence in the Cork District. Allen says that very soon, there could be four more waiting in the wings. In time, the number could grow to 30, he says. "A lot of wine tourism has traditionally been agritourism, but we have a critical mass of tasting rooms here in Spokane that are close to outdoor opportunities, an airport and easy transportation," says Allen, adding that the previous model of driving miles between vineyards in a rural setting has not only proven dangerous, but has also decreased in popularity among wine fans. Back at the Washington Cracker Co. Building, Vino! 's John Allen has changed tone. He's done talking about those rocky early years of Washington's — and Spokane's — entrance into the world of wine. As throngs of friends he's met through wine events over the years stop to say hello, he tells of how Washington wines have grown far beyond a novelty. The Inland Northwest has sprouted so many wineries and tasting rooms over the past several years, it could be a real challenge to visit them all in one week, based on your schedule. But the annual Spring Release Wine Weekend organized by Visit Spokane and its partners sort of encourages you to do just that — within reason, of course. More than 15 Spokane-area wineries and tasting rooms are throwing open their doors to the public for a special showcase during Mother's Day weekend, offering tastings and sales of newly released wines, along with live music, art viewing, food, and specials on wine. It's a perfect way to treat Mom and bring the family together for a memorable excursion, as both new and established wineries host wine lovers from all around.